One of the great delights of Catalonia is how quickly the terrain and countryside changes from one location or one area to the next. It means that you don't have to travel very far to get a completely different landscape. And in particular we can choose where to go for each particular season. So in summer we have the beaches, in winter the snow on the Pyrenees and in the autumn we have Montseny. Montseny is the mountain situated between Barcelona and Girona rising to about 1700m. In contrast to the more famous arid rocky fingers of the mountain of Montserrat, or the higher mountains of the Pyrenees, Montseny is a more gentle giant - softer and more deciduous, so when autumn comes it's the mountain to visit for mushrooms, chestnuts and to see the changing colour of the leaves. In the past year they've completed the C25 dual carriageway link that connects Girona to Vic and on to Lleida so the initial aim of our visit was really Roda de Ter, a town that sits above an oxbow of the river Ter close to the town of Vic. The road climbs up through the side of Montseny over the col and down to the Plain of Vic and as drives go it's very pretty through wooded hillsides and then with a grand vista across Vic and to the Pyrenees. The Plain of Vic is a great contrast to the relatively cultured Emporda landscape - much rougher in appearance with small round dry hills and views to cliff-y rockfaces (cingles) with houses almost tumbled on top of each other in an area that looks much drier than the fields of the Costa Brava. The reason for visiting Roda de Ter is that above the oxbox is the ruins of an village established by the Ibers that existed until medieval times at L'Esquerda which, from photographs and maps looked like it would be somewhere to explore as the river Ter at Roda is already a broad river even though the town is quite inland. 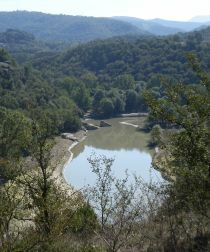 The next stretch of the river would pass through a number of dams and at Roda it is starting to snake its course through the hills before emerging on the other side near Girona. Roda itself feels like a small town. 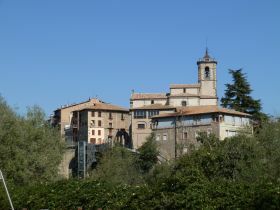 The church is the most prominent building and there are two bridges over the river. There is an older heart and then newer houses around the outside. 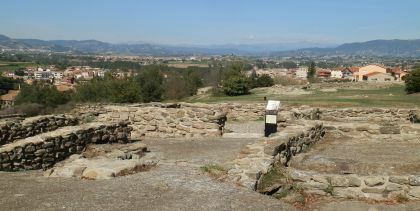 We navigated our way to the L'Esquerda prow where there is a small museum and some information signs around the ruins. The promentary is high-ish up with cliffs down to the river on two sides which means we couldn't explore down to river level. Most of the ruins are low stone walls with the exception of one larger standing wall from the old church. It would be fair to say that we were a little disappointed. We were expecting something with more of a visitor focus that made more of what could be seen and the dramatic bow the river makes and with easier access to the river level. The town itself is quite small and sits high above the river. The old bridge has a double row of arches - as if they built a new bridge on top of the older bridges foundations. The one remarkable thing we did find was a high water marker from 1940. We had to look up to see it - it was about 3m above us. Where we were standing to see the sign was already about 4m above the normal river level. So at some point the water must have been about 10-12m higher. There are walks along the Ter - there is a route that links the source in the Pyrenees to Torroella - and we could have explored a little more, but with no map we weren't sure of round trips. So having run out of things to see we headed back on the C25, but took a brief diversion to Espinelves which we had seen from the road on the way out. 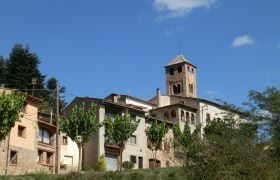 Espinelves is a small village in among the hills of Montseny but extremely well preserved and cared for. Each house had flowers in their gardens or on their windows and the old stone houses had almost all been renovated without changing their original style. Even the modern houses were in keeping with the older ethos and it almost felt like a little Swiss village with views of Montseny peaks in the background. There were several restaurants and walkers about and a delicious golden hue to the light through the trees.